Canvas these days can come as a traditional handcrafted painting, or the modern digital print. 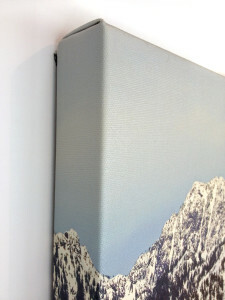 Framagraphic offers quality canvas stretching and custom framing for both. For printing on canvas see our Giclee Printing page. Canvas Stretching is the first step in presenting a canvas. One way to stretch a canvas is with a ‘gallery wrap,’ meaning the image of the painting wraps around the sides of the stretcher bars. This gives the impression that the canvas is painted on all sides with a clean finished look. Alternatively, black tape can be used to cover the edges of the stretched canvas. This helps cover unfinished edges and staples, or can be used if the image is simply not big enough to wrap around. 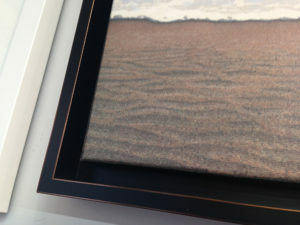 After stretching, the canvas is durable enough to withstand being hung directly on the wall, however a frame often makes the piece appear more finished. Framing a canvas also has the added value of protecting it from accidental damage on both the back and the sides. 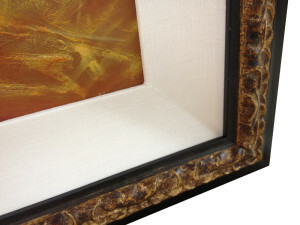 A floater frame allows the canvas to sit inside the frame, leaving a gap between the canvas and the moulding. Appearing to hover, the canvas can be seen in its entirety. This is particularly useful if the painting wraps around the sides of the stretcher bars. Traditional framing is also an option when considering works on canvas. Unlike the floater frame, there is no gap, and the frame sits on the canvas like a ‘cap.’ Historically, a linen liner was used to create a space between the painted image and the frame. 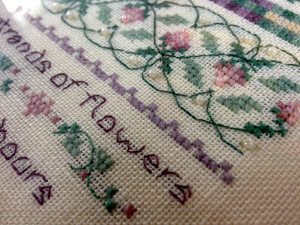 Needlework is another material we often work with at Framagraphic. Like canvas, it needs to be stretched, but being far more delicate, it requires a skilled framer. Keith is particularly experienced with designing frames for all forms of needlework, from needlepoint to petit point, cross stitch or embroidery.